Endoscopic harvest of saphenous vein is a relatively new technique developed to minimize the wound and postoperative complications. This technique has gained patients’ acceptance and become popular in cardiac surgical practices. Because most centers have limited experience with this approach, the authors summarize the clinical profiles of patients undergoing endoscopic vessel harvest (EVH). Between March 2001 and August 2006, 1,348 patients (945 men and 403 women) with a mean age of 67.2 years (range, 28–89 years) underwent EVH of saphenous vein for coronary artery bypass surgery, peripheral artery reconstruction, and miscellaneous conditions. The EVH technique was performed using the Vasoview system (Guidant, Menlo Park, CA, USA) under the assistance of carbon dioxide (CO2) insufflation. Technical success was achieved in 98.6% of the cases. Two saphenous veins were discarded because of obvious vein injury. The mean harvest time was 45 min: 68 min for the first 50 cases and 23 min for the last 200 cases. Nearly all the patients (98%) had saphenous vein harvested only from the thighs, whereas only 1.5% of the patients had saphenous vein harvested from the legs. Postoperative wound complications were experienced by 61 patients including 25 tract hematomas, 19 wound dehiscences or poor healing, 16 wound infections, and 1 overlying skin necrosis. Overall, 13 subsequent revisions were required for these complications. 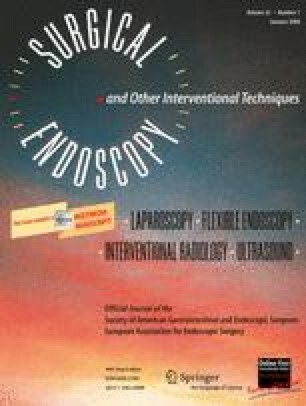 Detectable air embolisms occurred for 143 patients and numbness in the saphenous nerve territory for 169 patients. The findings showed EVH of saphenous vein to be a valid alternative to open saphenectomy, providing excellent surgical results. Therefore, EVH should be considered as the standard of care for saphenous vein harvest.